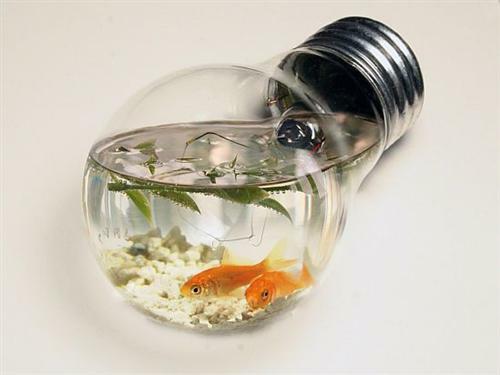 Fish Tank Friday: Fishbulb | OhGizmo! Before all you fish people get really upset, this is a render of a concept of a prototype of a fish tank made out of a recycled light bulb, designed by deviantART user mceric. It’s called Aqua Bulb, and provides a pre-built glass house for a few little fishies who appreciate snug quarters. While it’s a cool looking concept, I’m not sure how you’d go about feeding the poor fish once you get them in there, and it does occur to me to ask what potential health hazards could be caused by that burnt out tungsten filament. If people had these someone would randomly and stupidly put it in a light socket.